I somehow stumbled across Esther The Wonder Pig's Fan Page not long ago, and I loved her story! And I enjoy looking at her photos every day, well in one of the photos I saw Esther out it the snow and I instantly thought that she needed a coat. 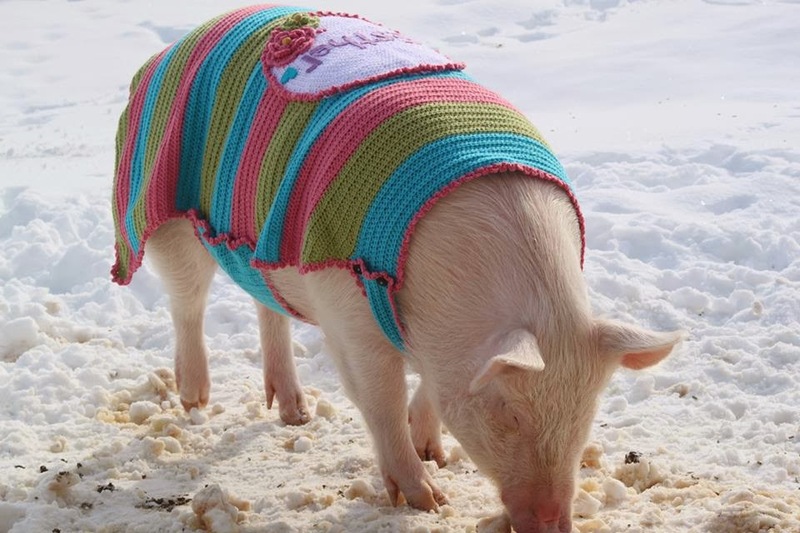 This is my first Pig Coat I have ever made...here is pretty Esther wearing her coat. I'm so happy that it fit her, I had a lot of fun making it! And I wrote up the pattern for everyone to enjoy! With the right side of your work facing you insert hook into any stitch, pull up loop and ch4 sc in same st. Then follow this sequence around the entire piece skip st, slst ch4 and then sc all in the same st. Fo. Decorate the patch and sew it onto your coat. Weave in all ends. And then add buttons to your neck and waist band. I am going to try this. I think it might also fit a large breed dog like golden retriever or a lab. I love this! 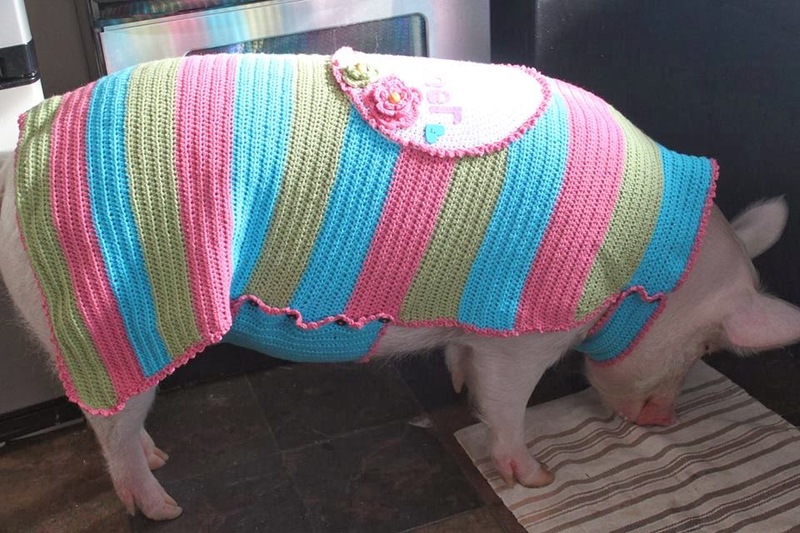 I have a large "mini" pig and would love to make this for her. I was wondering what the dimensions of this sweater are, thanks so much! I am sorry I didn't measure it before I set the coat off to Esther. But it is for a large pig, she is not a min pig. 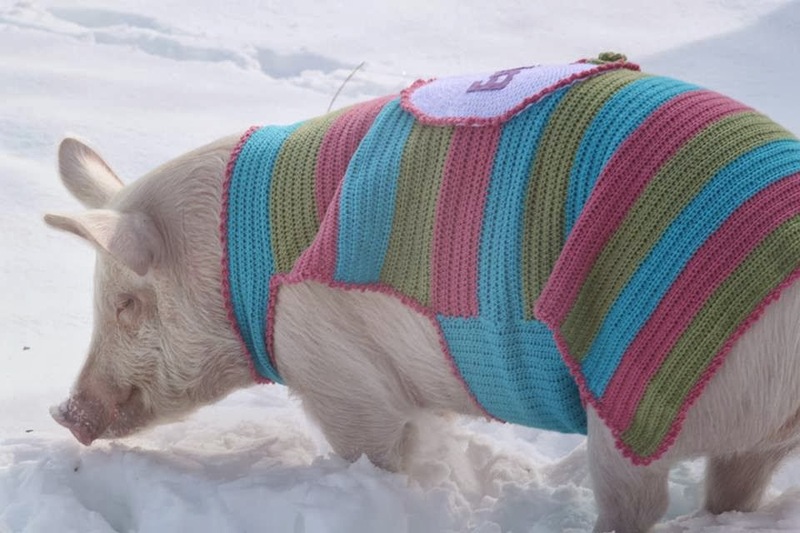 This coat is so beautiful that I regret I have no pig. I want to make this coat for Wally. He currently weighs about 350 pounds. Suggestions for modifying the patter? MiMi, I am working on a modified pattern. I'll let you know how it goes. My pig is a Micro-Mini, not so mini, pig. I wish I could send an image but it won't let me. What brand and color names did you use for the project? I am attempting it. I have to tweak it though cause my pig is a micro-mini, not so mini. I would add an image of him but it doesn't seem to let me. :) I will keep everyone abreast of my progress. LOL! Any idea about how much yarn it might take if you went with only one or two colors?